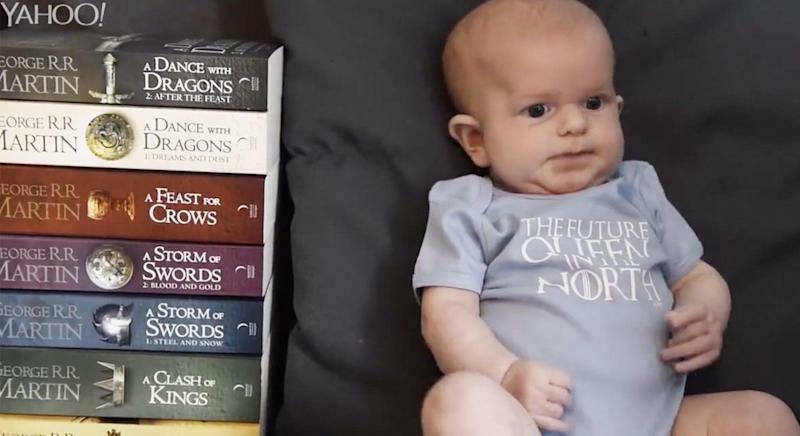 A couple has named their daughter after characters from three different hit TV shows: ‘Games of Thrones’, ‘Harry Potter’ and ‘Star Wars’. Bellatrix Daenerys Leia Davies was born to parents Kay, 29, and Glyn, 39, from Runcorn, Cheshire, on 1 January this year. The name pays homage to Bellatrix Lestrange, a dark witch in the ‘Harry Potter’ series; Daenerys, Mother of Dragons in ‘Games of Thrones’; and Princess Leia from ‘Star Wars’. Mum-of-five Kay explained how the couple decided upon the unusual name because of the difficult circumstances leading up to Bellatrix’s birth. Kay had been told she was infertile after having an operation to remove pre-cancerous cells from her cervix. Two weeks later, she fell pregnant with twins – but tragedy struck when one embryo absorbed the other, and Bellatrix’s twin died as a result. Doctors were left unsure as to whether Bellatrix would survive. Fortunately, Bellatrix was born at the beginning of the year. Although she arrived four weeks early, she’s a healthy baby. “I had always said she would be called Rosie but then because of what we’d been through already, I decided I wanted something a little bit more unique and special,” Kay said. “I’ve always loved the name Bellatrix since I got into Harry Potter and then we were watching Game of Thrones and I said to my husband that I wanted to put ‘Daenerys’ in her name as well. The proud parents have since spent thousands on Harry Potter, Game Of Thrones and Star Wars related products, including clothing and bespoke pram accessories. Dad Glyn admits not everyone is a fan of his daughter’s fantasy fiction inspired name – with some trying to shorten it to the more common “Bella”. “Our family thought it was unusual but they’re all big Harry Potter fans too so they loved it, they said it was unusual but beautiful,” he said. “Some people don’t know where it’s from though and they sometimes get it wrong and call her Beatrice or Bella, it just depends which walk of life they’re from. Kay and Glyn aren’t the only parents naming children after fictional characters. According to research conducted by website Play Like Mum, over 17,000 children across the UK have been named after Disney characters since 1996 and the trend is only continuing to flourish. Over a 12-year period, the number of children named after Disney has risen from 188 to 1,775 in 2017 with more girls being given regal titles than boys. Elsa stole the top spot thanks to children’s hit ‘Frozen’ with Tiana (inspired by ‘The Princess and The Frog’) and Aurora (the leading princess in ‘Sleeping Beauty’) followed closely behind.